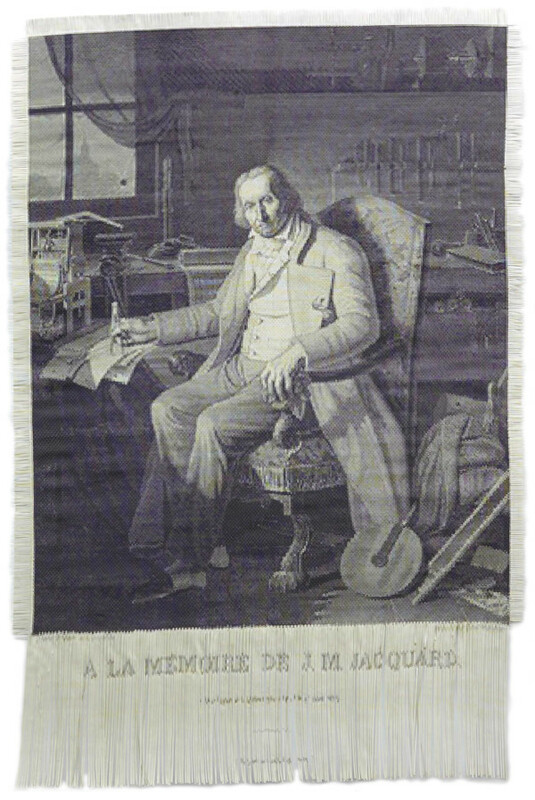 In 1804 French weaver Joseph Marie Jacquard invented the Jacquard Loom. This automated loom used a program of punch cards to weave complex designs – replacing the need for the human hand previously required in this process. These punch cards were an early form of digital information, and his machine paved the way for the computers we use today. My work plays with this system of weaving and image making in this different technological age. I have put the human hand back into the process, re-appropriating the function of the punch cards. The computer also plays a vital role, in this case in coming up with the design. Using a digital copy of the image from Wikipedia I have printed two physical ones. These are then meticulously cut by hand into strands of pixels that are then hand-woven back together. For each pixel to find its corresponding position in the grand scheme, there is an inherent human struggle involved. The material is wrought together to form a kind of memory of the original. This three- dimensional, torn and mended, textured version has the patina of human labour.This portrait of JM Jacquard is known as ‘The Most Famous Image in the Early History of Computing.’ Woven out of silk on a Jacquard Loom, this image took 24,000 punch cards to create and was completed in 1839. It was only produced to order. Charles Babbage owned one of these portraits; it inspired him in using perforated cards in his analytical engine.